Hi darlings! Today I’ll show you just how easy it is to ferment. 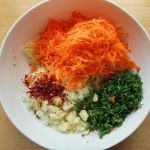 These 2 types of fermented veggies are super easy to make, ever so crunchy and they both have carrots in them. 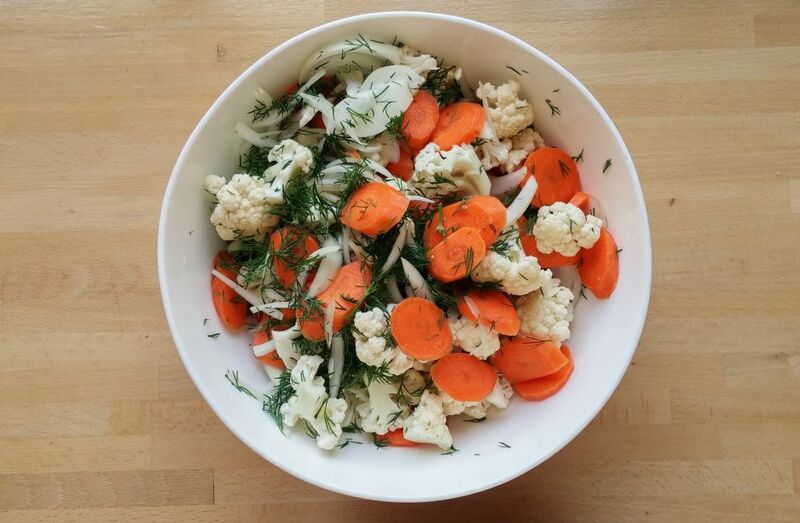 We’ll be making 1 Spicy Carrot Sauerkraut and 1 Fermented Cauliflower. 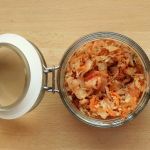 My super healthy homemade sauerkraut is my base recipe for most of my Sauerkraut’s, which is just divine on its own, but when in the mood to spice things up, this Spicy Carrot Sauerkraut is the perfect recipe. 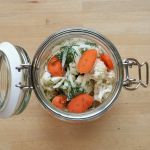 The second super easy fermented veggie we’ll be making today is my husband’s favorite, Fermented Cauliflower. Again, super easy, quick to make and oh so crunchy. 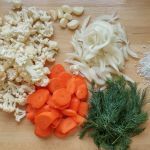 Chop the dill, peel and grate the carrots and finely slice the garlic. 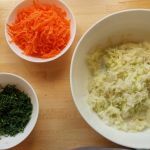 Add everything to the bowl and massage for about 5 minutes, until you see that the juices of the carrot have also been released and are starting to color the cabbage. 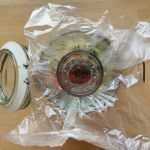 Place everything tightly into a glass jar with an airlock, making sure to leave about an inch of room from the top, and weight it down with a plastic sheet and a shot glass. This is done to ensure that everything stays under our brine and isn’t exposed to any oxygen. 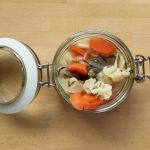 Close the jar and leave out and room temperature, away from direct sunlight, for 1 week before transferring it to the fridge. 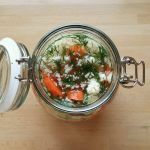 Wait an extra 2 -3 days before you dig in to your fermented veggies. First things first, make sure that your counter tops are clean before we begin. 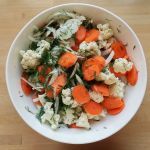 Wash all the veggies, peel the carrots and onions, and remove most of the stems from the cauliflower. Finely slice the garlic and onions and chop the dill. Cut the carrots into slices, then place everything into a bowl. Add the sea salt and give it all a good mix. Place into a glass jar with an airlock and fill with water. Make sure the water is at room temperature and not hot. Hot water will destroy the bacteria needed for the Lacto- fermentation process. Weight it down with a plastic sheet and a glass. Again, this will insure that everything stays under our brine and won’t grow mold. All that’s left is to keep our fermented cauliflower at room temperature, away from direct sunlight, for 1 week before transferring into the fridge. We learned how to make 2 types of Fermented Veggies. and the second a Crunchy Fermented Cauliflower also with carrots. Plus, it was all under 30 minutes. Liked it? Share it with your friends on the left hand side.